The price of this Tepee is a little more than you would expect in contrast to regular dome shaped 4 person camping tents. Essentially you may be paying for the design and style. Tepee tents are becoming ever more popular and common in the world of festival camping. However, this tepee is more than that, it is also designed as a hiking tent. In terms of its price the Playdo 4 Person Tepee Hiking Tents achieves full marks as it achieves the criteria of being less than $100 per person space. The Tepee is double layered. The internal layer is a complete mesh screening made of nylon. The internal material acts as both the protection from insects and also provides ventilation, which we will cover further. The exterior layer of the tepee is a water resistant polyester. The exterior layer of material has a thread count of 190 and is PU coated. What this means is that there are 190 threads for square inch of material and being polyester is already naturally water resistant. However, to ensure all time gaps between the material is protected an additional water resistant coating has been added to aid in the water beading off and not soaking through the material and into the tent. The Base of the Tent is made of a thicker material with a Denier level of 2000. This is fantastic as the thicker material will provide additional protection to the tents base from rips or holes from small stones etc. Features are best explained as what the tent has that makes it special. A little extra for your money and hopefully extra enjoyment and leisure o your adventures. The Playdo 4 Person Tepee Hiking Tent Scored averagely for features however it is rather cool what the tent can do with its design. As you would have seen above the tent can be used in a number of ways. Most hiking tents do not come with a vestibule as it is extra weight. This tepee however does come with a Vestibule and as a bonus the poles required pitch it is included in the package. 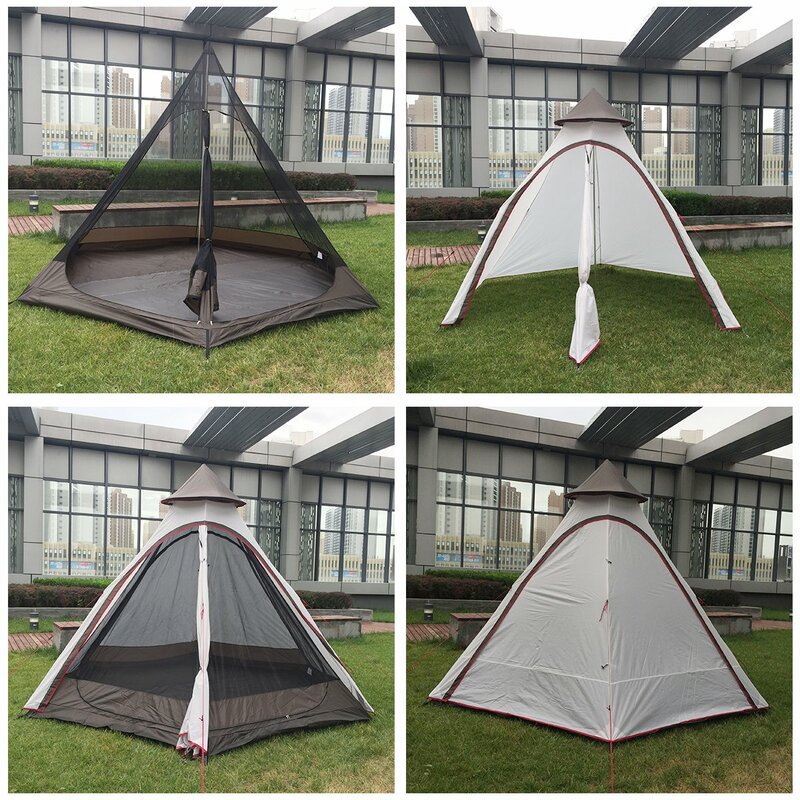 In comparison to other traditional hiking tents if they were to come with a vestibule, the poles would either be sold separate or the design would be integrated to be used with hiking sticks. The rainfly is rather unique as would be expected with a tepee design in contrast to a dome shaped camping tent. It completely covers the interior fly screen layer, only leaving space at the bottom for cool air to enter. Being made of polyester which is know to be a poor insulator and not very good for ventilation the design has abominated for such limitations. The Tepee comes with vents positioned at the top of the tent. Acting both as a waterproof cone and a method of circulating air. The cooler air can enter through the lower sections of the tent and through the door while the warmer air escapes via the ventilation cap above. Sadly the Tepee doesn’t come with any windows but it does come with two doors. However, this is only a limitation if you are wanted views from your tent during the day. To highlight further that this design is more for hiking than park camping the occupant would presumably be out and about hiking during the day anyway and would experience the most beautiful views imaginable. If you dint mind the lack of windows at night but want a well ventilated snug camping experience at night, this design can achieve this for you. If you purchase the black color for this tent than it would presumably come with the added black out feature, though as it isn’t advertised I wouldn’t imagine it is a complete black out, but rather an additional level of reduced morning light would be achieved by the color in contrast to the others. If you look closely at the design you will notice the bottom section of the tent is seemed higher up onto the tent body. This fantastic feature is referred to as a bath-tub designed base. What the design achieves is an additional level of water protection. In a poor weather situation water can run or build up alongside your tent and could possible seep in through the tents seams or material, by having the tent seams stitched higher up the tents main body this is essentially avoided. This will further protect you and your belongings from getting wet but also reduce damage to your tent via damp weakened seam stitching. The tent also come with internal pockets to provide neat storage for you valuable items. Durability is incredibly important. You want the peace of mind that your investment is going to last for a decent amount of time and for that duration of time be able to consistently perform in both good and bad weather. Playdo 4 Person Tepee Hiking Tents Has a number of features included to ensure its durability. Starting with the framework. The hiking tent is designed to be lightweight but is required to be strong enough to remain erect during a storm. This is achieved with the tents aluminum poles supporting 6 separate sections of tent wall material all further supported by a much thicker and stronger central pole. These poles in combination with the tents grommets secure into the ground with further additional support being provided by the external flysheet. As the tee pee is not exactly an A-shape tent nor a dome shape tent it requires additional internal support where the majority of the stress load will go as heavy wind will blow in and off the six corners of the tent body. All of these components all work together to ensure the tent structure is capable of withstanding an unexpected storm. 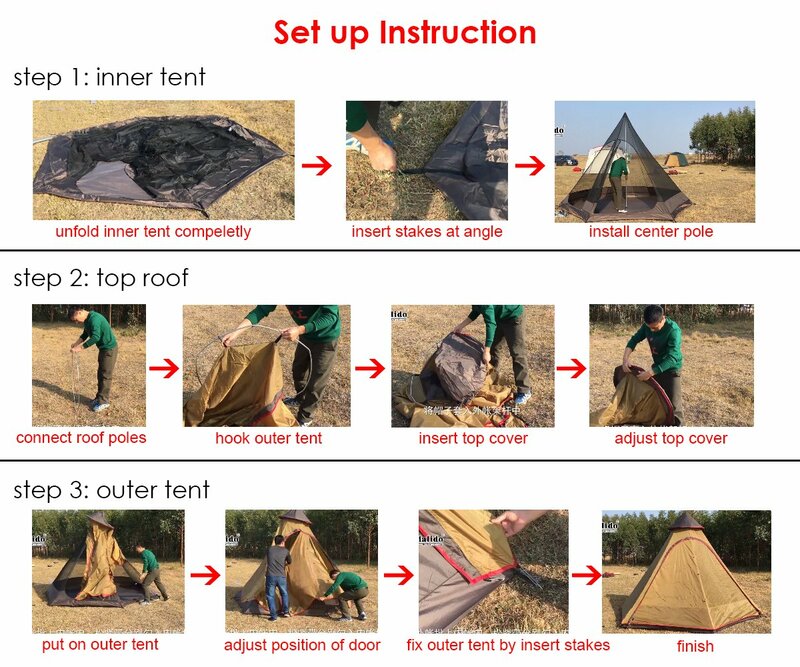 The Tents material is all stitched together twice using the traditional 4 layer method. However, through the seams are designed well they are not inverted nor are they sealed or taped. I would highly recommend purchasing and applying your own. The zipper system is a traditional nylon coiled design single zip design. Though the internal zips don’t truly require additional protection from external weather the outer zips have an additional sleeve covering them. This sleeve can assist the sips in performance by preventing wear and tear via weather, rain, rust and dirt. The size advertised for the Playdo 4 Person Tepee Hiking Tents states enough room for $ sleeping bags. Though I do not doubt this I feel it is worth highlighting that the structure has a giant pole I the middle of it. Further it is important to mention that most tents are advertised in sleeping bag spaces and this can often result in disappointment when the item isn’t big enough for its occupants. It is always a good idea to look for double the sleeping size for the number of people sleeping inside. This will allow enough room for your belongings and your sleeping bags section with possibly extra room as a walkway going towards the exit. I believe the tent is more suitable for 2 persons as it will achieve room for both a twin sleeping bad and offer the other side of the tepee as storage or a snug seating area. The size and design of the tent allows for both sitting, sleeping and in the center standing. The weight is also rather high, weighing in at roughly 12.3lbs it doesnt leave much room for other hiking equipment such as cloths food and cooking equipment. However to be fair it is not a hiking tent for a single person so it is more than possible to have the total weight of your camping gear divided amungst the amount of people. This should also icrease its practicallity in terms of abbility to carry. Though the tent is in a carry bag it would be plausible to strap it to the base or top of your backpack. With these conciderations in mind I would not recommend this as a tent for a single person but rather a group of two or more. While traditional tepees and other modern designs were capable of insulating 4 season levels of temperatures, this particular design does not. 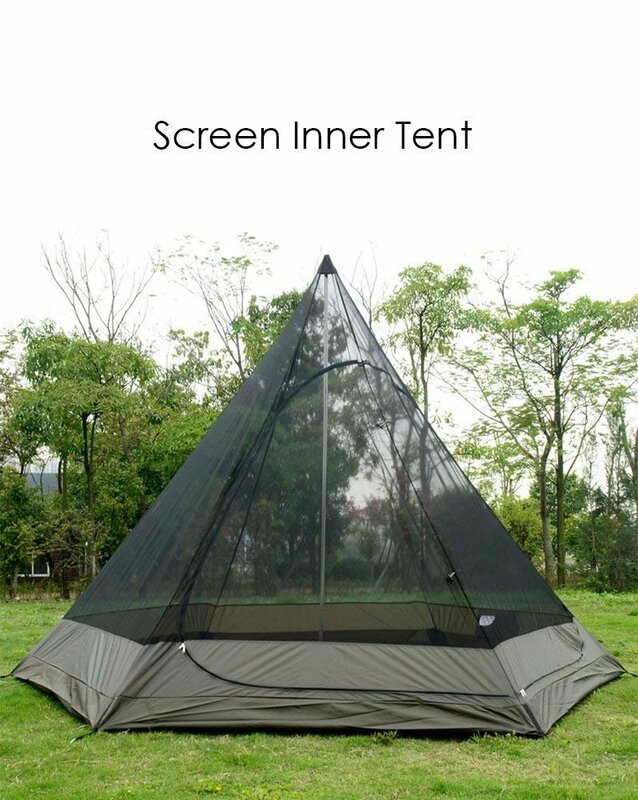 Due to being made out of an inner nylon mesh layer and external polyester material it is safe to presume that this tent is only appropriate for spring or summer, location dependent of course. This is because both nylon and polyester, while having excellent natural water resistant performance, performs poorly as an insulator. This issue can be easily managed with a little preparation. Study the area you plan to camp in and observe the expected weather and temperatures for the duration of your stay. The Playdo 4 Person Tepee Hiking Tent‘s score for wind resistant was a pass but nothing special. Though the tent does come with a few guylines and plenty of peg points, the tepee’s walls and internal pole are taking on a lot of stress during the wind. Extra guylines and an internal wind stabilizing system supporting the central pole could have gone a long way. These considerations are needed due to the shape of the tents walls. Unlike a dome shaped tent, the wind will struggle to roll off the tent walls fast and will instead push and crawl around and upwards as the tents shape is somewhat more wall-like in contrast to an aerodynamic dome shape design. This all leads to a larger stress load upon the tents poles. Though I am confident the tepee will continue to perform well in moderate bad weather I do not feel confident that it could withstand gailforce winds. This would be fine if it was simply a casual summer tent as you wouldn’t plan to camp in such expected conditions. However because this is advertised as a hiking tent, weather prediction is somewhat more difficult to account for as the journeys time and length may be more spontaneous than planned, resulting in a heightened chance of unexpected bad weather. Though the tent scored averagely for wind resistance it scored suprisingly well for water resistance. This is because the already water resistant polyester has an additional PU coating. PU coatings are essentially a liquid form of polyurethane which bonds to the polyesters threads ad little gapes between. The end result is a completly waterproof material. The only reason the tepee didnt score full markes for water resistance is beacuase the seams are not taped or sealed internally. If you want complete peace of mind and water resistane during bad weather I highly recommend applying wither tape or sealant to your seams. As you can imagine, the internal complete mesh structure is not water resistant. The base of the structure however is. 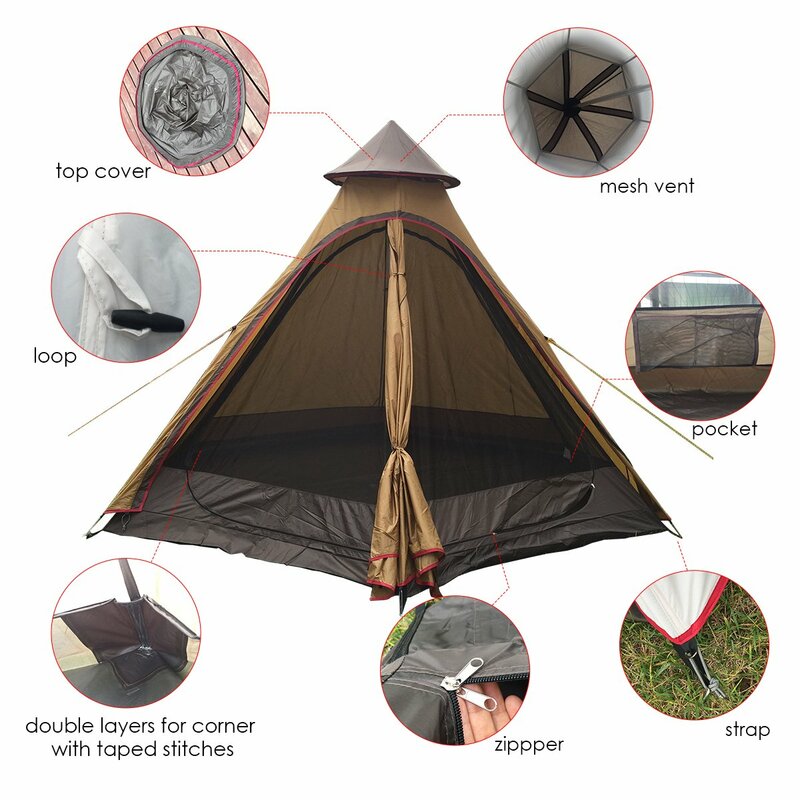 This is achieved by having the tents base seams sewn higher up onto the mesh body. This will essentially prevent any running or built up water entering your tent and soaking you and your belongings. this tent is not an expensive high performing tent. Set up time is roughly 10-15 minutes with two or more people. For a hiking tent this is rather slow. Hikers prefer a quicker easier set up as the need for emergency shelter may sneak up of them. Secondly if you are hiking all day you may not have a lot of spare energy to spend of erecting a tent. In the context of set up and pack up this tent would be better suited for weekend camping or for festivals rather than hiking. My final thoughts is that this tent isn’t really suitable as a hiking tent but would be excellent for summer casual camping. The Tepee scored very well for price, water resistance and size. However the tent only scored above average on material, durability, maneuverability and wind resistance. To be fair to this product the item would cos a lot more to score higher in the mentioned areas. 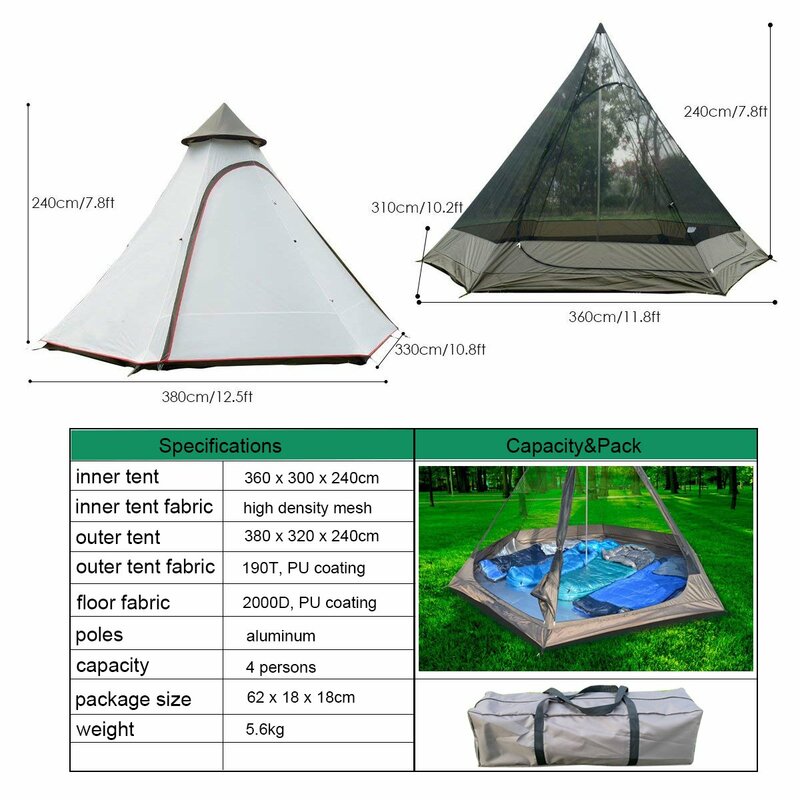 For what it is the tent is an affordable fun tent which will offer plenty of ventilation and keep you and your belongings dry and snug at night. Perhaps the items largest downfall is its limited warranty. A warranty or guarantee of 2-3 years really could have helped the items overall score. Though I don’t feel confident in the product to protect you from extreme weather, I do feel confident that the tent will provide moderate shelter and an all round great time during finer weather adventures. Tepees are just so cool.